Carl Maria (Friedrich Ernst Freiherr) von Weber (November 18, 1786 - June 5, 1826) was a German composer and key figure in the early Romantic period. He is considered to be the founder of German Romantic opera. A child prodigy, and touring piano virtuoso as a boy, Weber grew up in a musical family. From an early age, he had a fascination for opera. 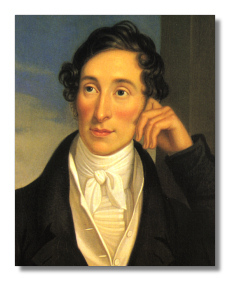 His major operas are Der Freischütz (1821), Euryanthe (1823), and Oberon (1826). Weber died in London of consumption less than two months after the premiere of Oberon. When his body was finally returned to Germany for burial, the eulogy was delivered by Richard Wagner.